Gem show blogger -shop, shop, shop! Readers are invited to submit tips, which the paper will sort through and post the best. Gem show blogger Coley Ward finished his opening posting with the admonition, "Now get out there and shop, shop, shop!" The first shows will be opening this Saturday, Feb 2. Tom Friedman, NY Times columnist, gets it. Craig Barrett, Chairman of Intel Corp. gets it. Gov. Janet Napolitano gets it. Read Friedman's "The World is Flat," Barrett's op-ed piece in the San Francisco Chronicle or Gov. 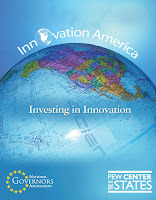 Napolitano's "Innovation America" plan published by the National Governor's Association. What they get is that American leadership - economic and political - is waning, due in large part to our falling behind in science and technology. The key to turning around America's fortunes lies in making long-term investment in our R&D capabilities. "To put it more bluntly: the United States is in the beginning of a period of relative decline. It may not be steep or dramatic, but the fact that it's happening is clear. Even if one assumes a slowdown, the other big economies will still grow at two and three times the pace of the West. Over time they will take up a larger share of the global economy—and the United States and Western Europe will have thinner slices. This is not defeatism, it's math." Barrett's piece is equally strongly worded. He concludes that, "The only way we can hope to compete is with brains and ideas that set us above the competition - and that only comes from investments in education and R&D. Practically everyone who has traveled outside the United States in the last decade has seen this dynamic at work. The only place where it is apparently still a deep, dark secret is in Washington, D.C."
Historically, as much as 85% of growth in US per capita income is from technology advances. In the last decade however, we have seen consumption in this country exceed GDP growth by about $600 billion a year, according to the lead story in Business Week by Michael Mandel. This essentially amounts to $3 trillion more being spent since 2001 than we earned. We did it apparently by borrowing on the equity in our rapidly rising home values. Now with the subprime debacle and housing prices flat or dropping, we cannot expect to maintain the artificially high growth of recent years. Congress is rushing to approve a stimulus package of $120-160 billion, plus or minus. The intent is to put more money in people's hand to continue consumer spending. Economists say this is the fastest way to prime the economy and that sounds like a valid solution, for the short term. But it is only a stop-gap measure. Once everyone spends their $600 checks, what do we do next? Everyone agrees that long term investment in science and technology is the answer. 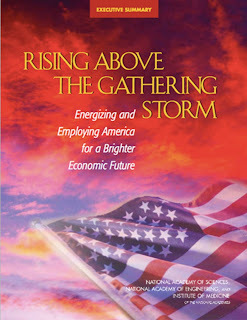 Last year Congress passed, with great bipartisanship, the America Competes Act, an outgrowth of recommendations from a seminal report published by the National Academy of Science in 2005, "Rising Above the Gathering Storm." But in response to President Bush's veto of funding bills, Congress cut about $22 billion from the 11 appropriation bills to satisfy the President's requested budget level and the omnibus became law. As Craig Barrett laments, funding was stripped for the America Competes Act. Americans will be empowered to appreciate the pragmatic outcomes of science, to distinguish science from non-science, and to participate in social discourse that provides insight into the nature of science. COPUS is networking hundreds of thousands of scientists, educators, and others in the scientific enterprise to share best practices and resources in connecting with the public and mobilizing them. As Craig Barrett concluded, "I genuinely think the citizenry of this country wants the United States to compete. If only our elected leaders weren't holding us back." 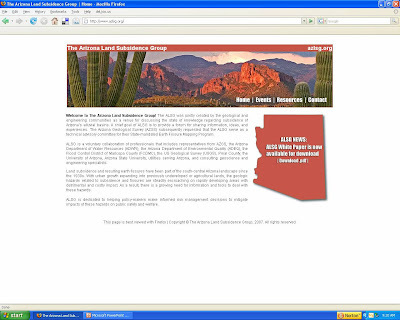 In 2007, AZGS transferred 4.5 terabytes of data and reports from our website to users. Usage increased roughly ten times during the year, with the biggest jump occurring in June with the release of the earth fissure planning maps. azlsg.org for the Arizona Land Subsidence Group, a professional group of engineers and geologists who help advise AZGS on natural hazards issues. A new web page is in development for the outreach-information center/mapstore we are getting ready to open in downtown Phoenix in partnership with the US Bureau of Land Management. An ABC News crew was in Phoenix earlier this week filming a story on gold prices and the growing exploration activity around the state for a story to be aired on the evening news and Nightline. Nyal Niemuth at our sister agency ADMMR, provided background info and was interviewed on camera. Haven't heard when this will be aired. Perhaps as a sidebar to the upcoming Super Bowl coverage? UA Mining and Geological Engineering Dept gets $2.06 million donation to set up the David Lowell Professional Program in Mineral Resources. David and Edit h Lowell had previously donated $1.9 million to create the Lowell program in economic geology. Lowell is a UA graduate in mining engineering and well known for his copper mine discoveries. An article in last week's journal Nature, by UA geoscience researcher Joellen Russell, makes a compelling case that global warming and melting icecaps will increase ocean circulation, reversing a long thought prediction that the circulation will weaken. This will have major influence on determining the impacts of global warming around the world. The NPS is going multi-media, with online broadcasts since May called "Ranger Minutes," a new weekly podcast, downloadable from the Park's website, and as of a few days ago, an experimental cell phone audio tour. Check it out at www.nps.gov/grca/photosmultimedia. The USGS Mineral Resources External Research Program (MRERP) announced that only the top 3 projects will be funded in FY2008, with one of those being from the University of Arizona. Professors Mark Barton, Lukas Zürcher, and Eric Seedorff will carry out the project, "Comparative Study of Jurassic To Early Tertiary Igneous-Related Metallogeny in the Basin and Range Province." 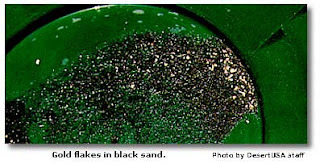 The announcement is posted at http://minerals.usgs.gov/mrerp/2008.html. In 2006, 15 projects were funded but in 2007, the program would only to commit to continuing funding for 3 of the 2006 projects, including one for Eric Seedorff at UA, "Dismembered Laramide porphyry deposits in southern Arizona: Links to Catalina core complex." No new projects were funded in 2007. One major intent and goal of the merger is to enhance the ability to carry out the mission of ADMMR. The statutory requirements and mission of ADMMR will stay exactly the same as they are now, when they become part of a merged agency. Actually, the effectiveness of the present Arizona model of two separate agencies has been seriously questioned for at least the last 20 years. Every other state in the western U.S. has a system of a state regulatory agency and a geological survey to deal with mining and mineral resources. In Arizona, we have the regulatory function in the State Mine Inspectors office, but share the mining and mineral resources duties among two agencies, ADMMR and AZGS. Big mining states like Nevada and Idaho have successful mining and mineral resources as integral programs in their state geological surveys. The AZGS-ADMMR merger draws on the best practices proven elsewhere. Rather than a knee-jerk rejection of the proposal out of fear, we must embrace the potential rewards this can bring to both agencies, to our stakeholders, the public, and the State of Arizona. Governor Napolitano is trying to protect the ADMMR budget from the current economic downturn. While other state agencies are slated for a 6% cut in their FY08 budgets, she is proposing only a 1% cut for ADMMR. The legislature is calling for a 10% cut across the board. If there was an effort to eliminate the agency, mission, or programs, it would be much easier to do so by simply letting ADMMR take the same budget cuts other agencies are taking. The Governor’s FY09 budget is balanced without consideration of the proposed merger. While the merger is expected to bring about efficiencies and economies of scale, the driving force is to enhance the ADMMR mission and the services it provides to stakeholders and its benefits to Arizona. The economic situation is telling us that we need to do this now. Actually, the duties and the ways we are directed to carry out our respective missions of the two agencies for mineral resources are very similar. · Cooperating with the Corporation Commission relating to the sale of mining securities. 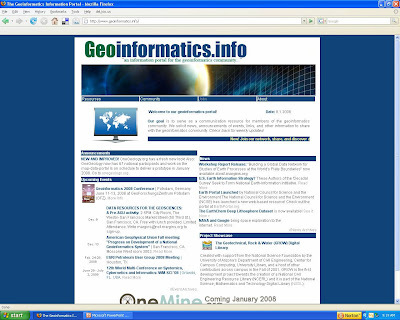 · Provide information the state's geologic character, geologic hazards and limitations and mineral resources. · Map and characterize energy and mineral resources and identify areas that may have potential for future discoveries. · Inform, advise and assist the public in matters concerning the geological processes, materials and landscapes and the development and use of the mineral resources of this state. · Encourage the wise use of the lands and mineral resources of this state toward its development. · Provide technical advice and assistance to other state and local governmental agencies engaged in projects in which the geologic setting, character or mineral resources of the state are involved. · Provide technical advice and assistance in geology to industry toward the wise development and use of the mineral and land resources of this state. AZGS has been supporting economic development of mineral resources in Arizona for more than 120 years. AZGS traces its history back to the Office of Territorial Geologist, established in the 1880s to explore the state for minerals. We were known as the Arizona Bureau of Mines from 1915-1976, Bureau of Geology and Mineral Technology from 1977, and Arizona Geological Survey since 1987. A lot seems to be made of the use of the word “promote” in the ADMMR statutes. However, look at how the legislature actually directs them to promote mining and mineral resource exploration and development. Read through the duties listed above. ADMMR and AZGS are both directed to carry out field investigations, make studies, publish and disseminate results, assist the public, government, and industry, maintain records and files, and more. While the AZGS is directed explicitly to carry out unbiased scientific studies of mineral resources, the intent is to ensure the public receives accurate, documented data collected under professional standards by trained experts. ADMMR standards are no less than that nor should they be. I met with ADMMR Director Dr. Madan Singh and his entire staff on January 22 for two hours to discuss the merger and share my ideas and plans. I committed to creating two external review panels if the merger is approved, to advise us on how to organize the new agency to best carry out the combined missions. I will convene engineers and geologists, rock club and prospector groups, industry leaders, professional and trade organizations, and others to look at the mining and mineral resources functions, resources, and ideas for the future. A second panel will draw on the Arizona museum community and mineral museum professionals from around the country. Tentatively, I expect the ADMMR’s technical staff would become a new stand-alone section in AZGS, dedicated to carrying their ongoing mission and duties in mining and mineral resources, but with more support from AZGS resources in mapping, outreach, and informatics. I don’t think that will be as difficult as some fear. The two agencies have been working together extremely well in recent years, cooperating on projects and sharing resources. The ADMMR offices will stay where they are and the staff will continue in their duties. ADMMR has more and better contacts with the business community; AZGS with the scientific and funding agencies. A combined agency with a combined set of stakeholders will be a stronger, more effective force in mining and mineral resource matters. The State Geologist serves at the pleasure of the Governor. The Director of ADMMR serves at the pleasure of a Board appointed by the Governor. History and precedence has kept the State Geologist out of partisan politics. Arizona’s first State Geologist, Dr. Larry Fellows, served for 26 years under four governors, two Republican, two Democrat. Nationwide, State Geologists are viewed as technical resources, outside the normal political debate. My own experience of nearly two decades as State Geologist in now three states, is that my boss may have some tasks or special projects they want to see pursued, but they do not interfere in the professional conduct and operation of the agency. The idea that ADMMR serves as an independent fourth branch of state government free from the political process is unrealistic. ADMMR is an Executive Branch agency, subject to legislative oversight, as is the AZGS. Governor Napolitano, in her State of the State speech on January 15, announced consolidation or elimination for 50 boards, commissions, and agencies, in the cause of government efficiency and effectiveness. The amount of savings expected from the AZGS-ADMMR merger are not named specifically, but are expected to be from administrative consolidation, not from cutting the programmatic activities. As above, any cost savings are expected to come from reducing administration costs and not from programs. In fact, AZGS will bring substantial new and larger resources into the combined agency that will allow existing ADMMR staff to be more productive. We all know that the ADMMR Chief Engineer provides a lot of great information. But how many phone calls and visits can one or two people handle every day? We will help improve dissemination of information through more publication and online posting of data and results. 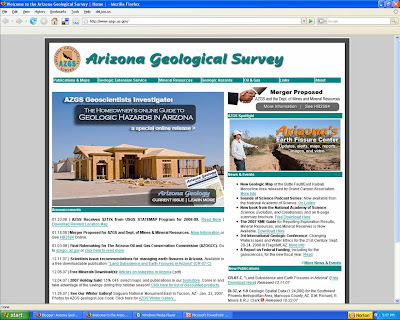 During 2007, AZGS saw a greater than 1000% increase in materials being downloaded from our website, www.azgs.az.gov. Not true. The bottom line is that AZGS will help underwrite the Museum’s education mission. 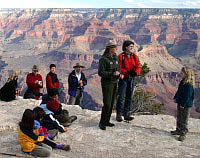 AZGS is expanding its outreach and education activities. We will bring that resource to support the Museum’s activities. 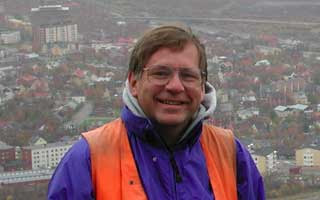 AZGS created the new Geologic Extension Service in 2007, and hired Dr. Michael Conway to head it up. Dr. Conway is working with Arizona teachers and in many other outreach and education activities across the state. He and his growing staff will be a great asset to the ADMMR Museum’s outreach and education efforts. I have publicly and privately committed that an outside panel of museum experts and educators will advise us on options and recommendations for the museum. No one on the ADMMR Board currently represents the museum community or has museum experience or expertise. In the new Geological Survey, we plan on bringing in that expertise and help realize the potential for the museum. AZGS has 5 geologists in our new Phoenix branch office, one of whom is co-located with ADMMR. 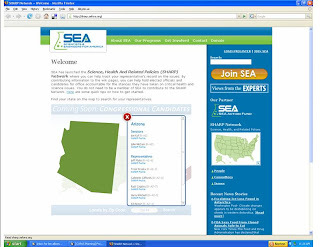 One of the benefits of the merger is providing a larger base of operations for AZGS to serve the greater Phoenix area, with its government and industry hub and better access for citizens who need Survey services and products. The Phoenix-based AZGS staff will be moved into the ADMMR building. However, ADMMR used to have 14 staff, with offices for all of them. The combined staffs after the merger will total only 13. In addition, ADMMR started construction of new office spaces on their mezzanine but ran out of funds to complete them. As the combined agency grows as we expect, we will look to completing those unfinished offices. This will not cut into the Museums space. While meeting with ADMMR staff on January 22, I described the Museum as the potential “800 pound gorilla” in the agency. The potential for raising millions of dollars for the museum endowment and programs can easily dwarf the budgets for the rest of the entire combined operations. I explained that I don’t know now how the museum should best be situated in the new Geological Survey, but suggested it should be a separate entity within the combined agency. Again, I want an outside review panel to offer options and recommendations. The AZGS Geologic Extension Service provides support services for the rest of the AZGS technical programs, including the library, website, publications, education programs, outreach, and public inquiries. Those same services will be available to support the Museum. To the contrary, we are envious of the ADMMR’s volunteer program and complimented them on their success in this area. We need to learn from ADMMR so we can attract more volunteers to other activities in AZGS and the combined agency. Although AZGS has not used volunteers to the extent that ADMMR has, we do have a lot of part-time, temporary student workers. AZGS is a formal affiliate of the University of Arizona and is in process of developing similar relations with ASU. This allows us to draw on university personnel, students, and resources. Right now, about ¼ of all AZGS staff are students. This helps keep our costs down as well as brings in bright energetic students who may consider careers with us after graduation. We think the new ASU Downtown Campus could be a good source of students to assist at ADMMR. We view mining and mineral resources as a critical area for investment. Last year our #1 priority budget request was to rebuild the AZGS mineral resources program. Gov. Napolitano agreed and proposed 2 new positions in FY08 and a third in FY09, along with substantial operational funds, to allow AZGS to carry out our statutory obligations in mineral resources. Unfortunately, the State Legislature rejected her proposal without discussion. Instead of pulling ADMMR staff away from mining and mineral resources activities, we will be reinvesting AZGS resources into these programs and seeking additional support from outside to build on them as priority areas. It’s true that mining and mineral resources will be in a larger agency that also handles mapping, oil and gas, geothermal, coal, groundwater, natural hazards, core repository, and other issues. However, the new Geological Survey will be a larger, more effective and influential agency, with access to greater resources. There is symbolic value in having an agency dedicated entirely to mining and mineral resources, but the agency is so financially constrained that it cannot do what is intended. As the agency has shrunk in recent years, it is able to do less and less of what the community expects. So, the real message is that Arizona keeps its mining and mineral agencies small, separate, and under-funded. That is the more powerful symbolism. We have 120 years of documented history to show we carry out our statutory mandates without problem. We also have examples of ongoing activities in petroleum and geothermal resources that are further proof. The best way to support mining and mineral resource exploration and development is to provide solid, reliable, professional data in geology, engineering and economics, get it out to the people who need it, and help them understand the value and role of it in the decision-making process, whether that’s for making an investment in Arizona or regulating how that is done. 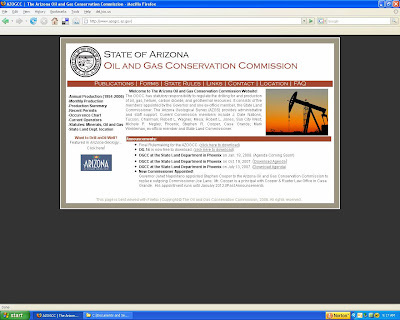 For the last 16 years, AZGS has carried out all the technical and administrative functions for the Arizona Oil and Gas Conservation Commission, the state’s independent regulatory body for petroleum. Yet, at the same time we are tasked with identifying new petroleum exploration opportunities across the state and encouraging development. If we can both regulate and promote the petroleum industry at the same time, we should be able to readily accommodate the combined mining and mineral resources missions. In fact, we have been the lead agency for decades in geothermal resources, both mapping and characterizing the states resources and working with industry and government to further their exploration and development. Not true. We applaud ADMMR’s support for these groups and pledge to continue the cooperative activities with them. I want to hold public stakeholder meetings and want the clubs involved in advising us on how the new Geological Survey can help meet their needs. I am also available to address any questions or concerns, and meet with the club officers to discuss the merger. The AZGS mission has included encouraging exploration and development of mineral resources since our inception and it has not damaged our credibility when presenting the results of our work. We do the same kinds of studies, reports, investigations, and public dissemination as does the ADMMR staff. Our credibility relies on maintaining high professional standards, documenting our results, and ensuring accuracy in everything we do. 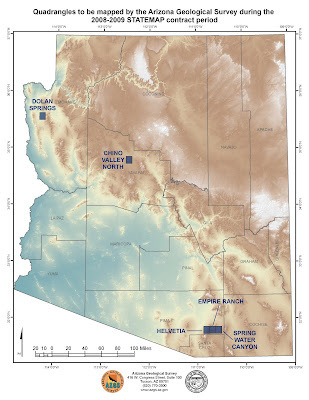 AZGS recently published a detailed geologic map of the controversial Rosemont copper mine area in the Santa Rita Mountains and will be starting mapping of surrounding quadrangles to help address speculation that the mine could adversely affect groundwater resources in the area. 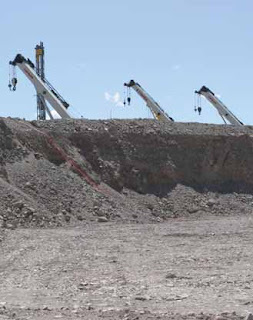 AZGS geologists work with town planners to advise them on locations and extent of industrial minerals and the impact of zoning decisions on resource affordability and availability. AZGS geologists also recently met with residents in one community concerned about asbestos in quarrying operations and were able to document that no asbestos occurred in the rock units being mined. The credibility claim is also insulting to ADMMR, by implying that its promotion of mining in the state is biased and not credible, and they are simply a mouthpiece for industry, regardless of the facts. What is the ADMMR future if the merger is defeated? The State Legislature’s proposed budget cut for ADMMR for the present fiscal year is 10% across the board. ADMMR Director Dr. Madan Singh testified to the Appropriations Committee on January 10 that this cut will force him to terminate 2 or 3 of their 7 state-funded staff immediately. Another round of budget cuts is coming for FY09 to meet a state shortfall bigger than the current one. What does this portend for a small agency with huge fixed costs? A big problem for ADMMR is that nearly half of their state funding goes to pay rent on the museum building that houses them and that is not going down. State budget cuts disproportionately hurt ADMMR because they rely on state general funds for 7 of their 8 positions and all of their rent. The agency once had as many as 14 staff members and is no longer able to provide many of the services and resources they did before because of repeated budget cuts. The alternative to merging ADMMR and AZGS is not simply maintaini ng the status quo; it’s a question of whether the agency will be able to survive at all without partnering with a larger and more diversely funded agency. A merger with AZGS would bring ADMMR longer term financial stability and the potential to actually grow rather than be constantly battling just to stay alive. Conversely, the AZGS budget grew by about 50% in FY07 and our staff increased 65%. We opened our first-ever branch office in Phoenix and now have 5 geologists based there. Our funding-base diversified last year with at least 6 new funding sources and new funded projects continue to come in. Less than half our revenues now come from the state general fund, leaving us much less vulnerable to the vagaries of the state budget. Bringing ADMMR into the Survey will offer opportunities to pursue enhanced revenue streams for their programs through external grants and contracts, directed investment, corporate sponsorship and underwriting, fund-raising, expanded community involvement, and philanthropic and private support. Wishing that the State Legislature will come to the rescue with new monies for ADMMR has not worked in the past and seems unrealistic in the current economic environment. three 7.5' quadrangles in the Rosemont-Helvetia-Empire-Sonoita basin area centered on the Rosemont copper prospect in the Santa Rita Mountains area. the Chino Valley North 7.5' Quadrangle north-northeast of Prescott. the Dolan Springs 7.5' Quadrangle northwest of Kingman. Selection of the map areas was made by the AZGS State Mapping Advisory Committee, made up of geologists from industry, consulting, and state and federal agencies. The decision to map around the Rosemont copper mine area was driven by the need for more accurate and detailed information to constrain groundwater models and the impacts from the proposed mine. Maps in the Prescott area are intended to examine bedrock aquifers including structural controls on groundwater. This area is in the news this week with reports that the Salt River Project may sue over plans by Prescott, Prescott Valley, and Chino Valley to pump water from the Big Chino aquifer which also feeds the Verde River. Mapping of the Dolan Springs quad in the Kingman area is intended to help prepare for expected development and rapid population growth in this area. Over the 15 years of the STATEMAP cooperative mapping program since 1993, AZGS has received $2.634 million for geologic mapping, the 4th largest amount among the 50 states. Freeport McMoRan is expanding development at their Morenci, Sierrita, and Bagdad mines in Arizona and the Cerro Verde mine in Peru at a cost of about $400 million. These projects should add 200 million pounds of copper and 7 million pounds of moly by 2011. These figures were announced in Freeport’s 4th quarter earnings report yesterday. Another $100 million is being invested to restart the Miami mine in Arizona. That should produce 100 million pounds of copper per year for 5 years starting in 2010. Exploration drilling is underway at the nearby Lone Star project. Freeports earnings were below expectations as the price of copper softened in expectations of reduced demand home and abroad – especially in China – due to the economic downturn. However, the flailing of the world’s financial markets are pushing gold higher, hitting $916/ounce on Jan. 15 and running over $900 as I write this. Freeport reported gold production of 161,000 ounces in the 4th quarter, and 2.3 million ounces for all of 2007. Legislation was introduced in the Arizona Senate to move the Board of Technical Registration into the Registrar of Contractors office. BTR oversees registration of technical professions, including geologists. The bill, SB1171, introduced by Sen. Kenneth Cheuvront, had its first reading in the Commerce Committee today. This legislation has been rumored in geologic community and other circles for the past week and seems to be drawing intense interest from the professions regulated by BTR. "The Board is a regulatory agency for the following professions and occupations: Architects, Assayers, Certified Remediation Specialists, Clandestine Drug Laboratory Site Remediation On-Site Workers and On-Site Supervisors, Engineers, Geologists, Home Inspectors, Landscape Architects, and Surveyors." The ROC has 146 employees overseeing 48,521 licensed contractors (as of January 2003). BTR has 18 employees. It's not readily evident how many licencees they regulate. The proposed merger of the Arizona Geological Survey and the Arizona Dept of Mines and Mineral Resources will link two agencies with complementary missions. Cooperating with the Corporation Commission relating to the sale of mining securities. Provide information the state's geologic character, geologic hazards and limitations and mineral resources. Inform, advise and assist the public in matters concerning the geological processe s, materials and landscapes and the development and use of the mineral resources of this state. Encourage the wise use of the lands and mineral resources of this state toward its development. Provide technical advice and assistance to other state and local governmental agencies engaged in projects in which the geologic setting, character or mineral resources of the state are involved. Provide technical advice and assistance in geology to industry toward the wise development and use of the mineral and land resources of this state. There is nothing in either agency's mission that contradicts the mission of the other. As I see it, the combined agency will carry out the integrated duties with the same dedication to accuracy, quality, and professional standards that they operate with now. The second annual Science Blogging conference took place in North Carolina over the weekend (http://scienceblogs.com/clock/2008/01/science_blogging_conference_vi.php) and the blogosphere is alive with reports and comments. What I glean sitting here across the continent, is that science blogging is a major force in scientific communications and between scientists and the lay community. The use of websites has transformed our world already but the integration of blogs, wikis, open access journals, web service, video and picture/slide hosting sites, online social networks, and online co-laboratories is about poised to blow us all off the outcrop. Legislation was introduced late last night to merge the Arizona Department of M ines and Minerals (ADMMR) into the Arizona Geological Survey. 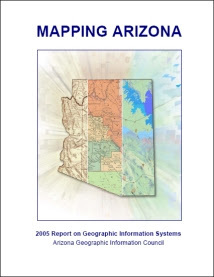 In addition, the Arizona Geographic Information Council (AGIC) would be transferred from the State Land Department to the AZGS [see GIS report, below]. This follows on Governor Napolitano's pledge in her State of the State speech on Monday to eliminate or consolidate 50 boards, commissions, and agencies. ADMMR includes the popular Arizona Mining and Mineral Museum in Phoenix, which will become part of the combined agency. HB2584 was introduced by Rep. Theresa Ulmer of Yuma. If approved by the state legislature, and signed by the governor, the merger will take effect December 31, 2008. The agency will be headquartered in the AZGS office in Tucson, while the mineral resources program and museum will continue to operate in its present Phoenix location. The two agencies have worked together to cooperate, share resources and avoid possible overlap during the past two years. We were not seeking this merger, but we do support it. The merged agencies should have some economies of scale and be better able to meet the state’s needs for good reliable information on minerals, mining, and geology. Also, the Mining and Mineral Museum is one of the premier such institutions in the western U.S. but has lacked the resources to reach its full potential. Arizona is the number one mining state in the nation and deserves a world-class museum that showcases the role and impact of minerals in our economy and history. I think we can make the Mining and Mineral Museum one of the most exciting and premier attractions in Phoenix. The Arizona Geological Survey grew out of the Office of the Territorial Geologist that started in 1888, became a founding component of the University of Arizona in 1891, and was known as the Arizona Bureau of Mines through most of the 20th century. In 1988, the legislature moved the AZGS out of the university, making it an independent state agency. Arizona does poorly in science and technology education and workforce development, has mixed results in R&D outputs, yet excels in high tech business formation and funding. 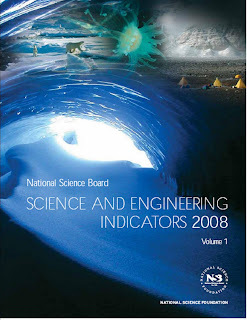 These are the results in the 103 pages of the State Indicators section of the National Science Board “Science and Engineering Indicators 2008” report released Tuesday (http://www.nsf.gov/statistics/seind08/). We are in the top quartile in engineers as part of the workforce but in the bottom in life and physical scientists. We also excel in the percentage of S&E graduates, aged 18-24, but are in the bottom ranking for S&E as a percentage of all advanced degrees. Arizona is in the second tier in high tech employment and in the top tier for new high tech business formation. Admittedly my perusal of this report is cursory, but the bright spots in this report for Arizona are on the jobs and business side. We look weak in education and preparation of our students to take advantage of the opportunities out there. A new online tool allows the public to track and contribute information on how elected officials and candidates for office voted or stand on issues in science, technology, and health policy. Scientists and Engineers for America (SEA), a non-partisan, non-profit organization created the Science, Health and Related Policies (SHARP) Network - SHARP.SEforA.org. All of Arizona's congressional members are profiled, although many topics are yet to have any content. SEA announced that, "The network will be updated continuously with help from people around the country and the candidates themselves." The web site allows individuals to upload and edit information about offiicials by submitting that officials floor statements, constituent letters, campaign statements, or other work. 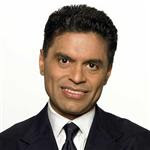 This site covers federal elected officials and candidates. A companion page or site is needed to track state officials as well. The Arizona Legislature proposes 10% cuts for the Arizona Geological Survey and the Arizona Dept. of Mines and Mineral Resources in the current budget, but no reductions for the State Mine Inspector, because his office deals with public safety. The governor proposes smaller cuts, but for all three agencies. The Legislature also wants the cuts to affect the state's universities, something opposed by the governor. How the potential cuts would affect geoscience and related programs at the schools is unclear. The Legislature wrapped up three days of hearings on the fiscal 2008 budget yesterday. AZGS and ADMMR were included in the lump sum agencies (ie, our budgets are each in single line items as opposed to multiple lines like the large agencies have). The 20 or so lump sum agencies were reviewed and disposed of in 15 minutes. Madan Singh, director of ADMMR, was allowed to make some brief comments, noting that 47% of his agency budget goes to rent of the Mining and Mineral Museum building and is fixed, so a 10% cut halfway through the year will disproportionately affect their staffing. He predicted the loss of 2 or even 3 of their 7 positions if the budget cut goes as proposed by the legislature. AZGS plans on handling the cut by not filling vacant positions, reducing some operating expenses, and funding more administrative and support functions with indirect funds from external contracts. We have also returned to our university roots to a degree by using more students in a variety of positions - from staffing the front desk, to digitizing maps, web development, and field work. Today, about 25% of the AZGS total workforce is made up of students, both college and some high schoolers. Fill abandoned mines with old tires? State Senator Jake Flake jokingly volunteered to help toss the old tires into the mines. Will drought lead to more swamps in Arizona? When drought hit Chaco Canyon in the 800-900 A.D. period, it resulted in a large sand dune that blocked the canyon, creating a lake and delta behind it, that offered a wonderful farming environment. When the dune dam disappeared around 900 A.D., so did the inhabitants for more than a century, returning when they figured out new farming techniques, according to geo-archeologist Eric Force, in a talk to the Arizona Geological Society tonight [above, Chaco Culture National Historical Park, NPS]. Eric then postulated, "Could modern climate change lead to drought that will similarly increase eolian conditions across Arizona, blocking more canyons and washes and producing swampy playas behind them and locally rising water tables?" The white tents started going up all over Tucson in recent days, in preparation for the Tucson Gem & Mineral Showcase, a loose confederation of 49 independent shows leading up to the classic Tucson Gem and Mineral Show on Feb. 14-17. At least 50,000 buyers and sellers are expected this year, although some estimates are dramatically higher. The TGMS is probably the biggest such event in the world. If you haven't experienced it, it's hard to visualize. Shows are set up in hotels and motels, in tents, and in parking lots. Some are open only to retailers, most are open to everyone. The gems, minerals, fossils and [above: Tumamoc Hill behind tent across from the Tucson Convention Center] other sale items on display make it a street fair version of the Smithsonian and every other natural history museum you've been to, but everything here is for sale. It's Tucson's equivalent to Mardi Gras. Streets are crowded, traffic is intense (especially with all the I-10 construction), restaurants are jammed, and good luck getting a hotel room close to the action. Some motels look like they scrape by all year just to cater to the TGMS crowd. Stay tuned for reports and pictures. Two case studies using updated, higher resolution maps in Canada found that they made mineral exploration campaigns "more efficient, more effective, and less risky than old, coarser resolution maps." The analysis found they located 60% more targets with an exploration campaign that is 44% more efficient. The joint publication of the USGS and the Geological Survey of Canada (http://pubs.usgs.gov/pp/pp1721/) reports that the mapping produced a multiplier value of up to more than eight times what it cost to produce. 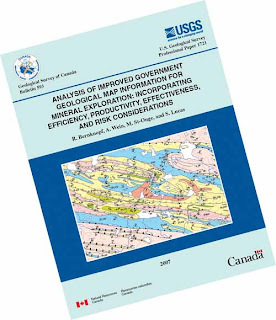 The report is: "Analysis of Improved Government Geological Map Information for Mineral Exploration: Incorporating Efficiency, Productivity, Effectiveness, and Risk Considerations" by R. L. Bernknopf, A.M. Wein, M.R. St-Onge, and S.B. Lucas, U.S. Geological Survey Professional Paper 1721 and Geological Survey of Canada Bulletin 593. The outcome of the federal omnibus spending bill for fiscal year is a "squeeze on funding of geosciences research across the federal agencies," according to the American Geological Institute, in their Government Affairs Program monthly review. AGI says the omnibus bill cut $22 billion in spending from House and Senate bills, because of the President's veto of the "mini-omnibus" bill earlier. The Department of Energy’s Office of Science, where additional basic geosciences research is funded also received a last minute reduction of about $500 million compared to funding levels in the House and Senate proposals. Again the geosciences will see real cuts to basic research support, continuing a trend in the Office of Science of decreasing funding for geosciences. NASA’s Earth science division, Department of Energy’s Office of Fossil Energy and the U.S. Geological Survey will receive small, sustaining increases for geosciences research to keep a wide variety of programs and projects afloat. Congress restored a $22 million requested cut for the USGS Mineral Resources Program, giving it a total budget of about $50 million and provided $6.4 million for the Water Resources Research Institutes. Details on the entire federal R&D funding is at the AAAS site, http://www.aaas.org/spp/rd/fy08.htm. The AGI monthly review can be read at http://www.agiweb.org/gap/email/review1207.html. A year ago, when I started this blog, I tried to find examples of other geology blogs that I could learn from and maybe emulate. I didn't find as much as I expected. Go to many of these and find links to dozens of others. I was pleasantly surprised to find other bloggers have picked up items from this blog and put their own perspective on them or simply passed them along to other readers. So, I'm energized after taking a quick tour of what others are doing and want to learn from them, track more of the current geo-news and activities and make Arizona Geology more relevant and interesting this next year. Thanks for reading.